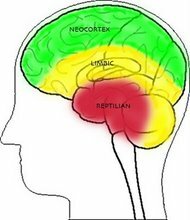 The oldest and most critical part of the brain for survival is the basal ganglia – sometimes called the reptilian brain as birds and other non mammals also primarily driven by this structure. We share this part of the brain with cats and dogs which is why they make such good pets. The neocortex, found only in certain “higher” mammals is associated with functions such as language, abstraction, planning and logical thought.